Ultimately it depends on whether you want to look like the kind of player who turns up to a skirmish in trainers, but you won't be running like a madman. If you have to maintain a position, and you're in un-camoed clothes, the enemy team's snipers will target you as you are the easiest to see. 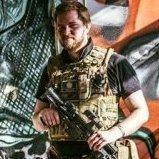 But for Urban/CQB I wouldn't reccomend the spec-opsy black combat gear, most of the CQB games are quite dimly lit, but there are usually brightly lit positions and guys going round with SureFire torches on their guns. As black is a solid colour the human shape is easier to make out whereas having a digital/striped pattern on your combats you will be more difficult to see. Apart from that wear a pink tutu if you want, its your game play like you want. Some sites may not let you on without the appropriate footwear, so as a minimum invest in a decent pair of boots. If your on a budget then Sports Direct do some boots for £30 in black. Well most players choose airsoft over paintball because of the realism.. although for your first skimrished a hoody and tracksuit would be fine you might find that if you want to go to better, more established site they may on like it so much and if you turn into a regular at the site and still wear non-military type clothes they may also not like that... same reason many sites require people to camo tape their two tone guns as it takes away the realism..
Also, however bad it is there is quite a high chance you'd get prejudiced against and other players would assume that you're inexperienced, hiring or not really going to play properly..
As with what the others above have said, while most sites don't have a rule that says "Thou must wear multicam at all times, on pain of death!" it's probably worth investing in some camo gear. You'd be amazed how much easier it is to spot someone wearing even dark clothes than someone in full DPM. Also, surplus kit is actually cheaper than proper clothes (unless you're heavily into George brand clothing) and will last a heck of a lot longer. Believe it or not, addidas did not design their track suits to be dragged through a forest and chucked into a load of mud every weekend, they'll get ruined quickly! Reference boots, I'd recommend a pair of surplus german para boots, they're almost always broken in already, cheaper than dirt and they're pretty much bomb proof. For all of the above, try ebay and/or your local surplus shop. Failing that: www.armysurplus365.co.uk do a wide range of stuff at decent enough prices. to build on what Nick said in his first post i hate people who wear trackie's and a hoody or jean's and a hoody because their cheating shite's. that is how most people will view you. JC Don't forget the added benefit of 5% Off your order from 365 if youyr a Forum supporter! Tbh I was always of the opinion that at airsoft ranges camo isn't going to make all that much difference. Sure it helps, but ultimately you'll give yourself away by moving, as the eye notices it far more readily. Very few people, camo or not, are that great at using it properly. The only reason I got camo was to go for a more authentic look, because as Nikona said, airsoft is about the realism. If you're not fussed, then play paintball instead. There's also the point Cheese brought up about the hardwearingness of camo gear made to military spec. A pair of jeans will be ruined by mud from one woodland game if you get properly stuck in, so camo is actualy cost effective, as well as beneficial to you visible image when things get tense and you're trying to stay low, as well as your perceived image. As people have said, you will almost certainly be marginalised for wearing casual street clothing to a skirmish, especially trainers. However, every site I've ever been to have had woodland camo jumpsuits available to hire, so you could just stick one of them on, might cost you an extra £5 a day to hire one though, so again, having your own is just more cost effective. Have a look on your local market or for an army surplus shop near you. You'll be surprised how cheap stuff can be! Old British army DPM can be bought for a few quid a set if you shop around. I've not bought from them, but they have good feedback That's jacket and shirt for less than £20 inc postage! I'm lazy, hardly reed any posts, but here's my take. You can play in casual clothes. I first skirmished in dpm trouses and black hoodie. HOWEVER I would not feel comfy in full tracks. dirty, mud, rain, wetness, bbs, gas grenades, traction etc. etc. they be shredded in no time.. and I dont really feel like geared for combat in comfy clothes. Yea thats a generic issue, while I do have an encyclopedic knowledge of camo patterns if you're on a budget just stick to DPM.. if you want something slightly you could go US woodland it'll be a little more but not that much! Have you go a vest etc for holding magazines? do you know what type of vest it is and is it in DPM camo? I started out with DDPM which I got from my local surplus store. It cost me less then £100 and that was for boots, vest, shirt, trousers and knee pads! My son's multicam plate carrier was that on it's own. Next time I went into the surplus store they had some US Tri colour which was nice as well as cheap! Got that now as well. That is an absolute bargain, so much so I'm going to bookmark it so I can refer people to it in future!